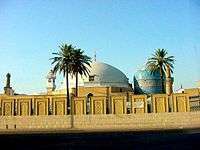 Naqshbandiyya Khalidiyya or Khalidiyya is the title of a branch of the Naqshbandiyya Sufi lineage, from the time of Khalid al-Baghdadi until the time of Shaykh Ismail ash-Shirwani. Gammer, Moshe. Muslim Resistance to the Tsar: Shamil and the Conquest of Chechnia and Daghestan. Portland, OR: Frank Cass, 1994. Shaykh Muhammad Hisham Kabbani, Classical Islam and the Naqshbandi Sufi Tradition, Islamic Supreme Council of America (June 2004), ISBN 1-930409-23-0.